Most statin-based cholesterol lowering drugs do not take care of the underlying causes of triglycerides too high and, in addition, come with a hefty listing of side-effects like, for example, blocking a natural coenzyme CoQ10 production necessary for the heart health. In addition, a majority of people who are on a low-fat diet will naturally tend to consume more carbohydrates that raise your blood sugar and triglycerides levels to fill in the caloric gap. 1. Organic extra virgin olive oil from the first cold press contains a bounty of good for you fats to nourish you and not raise your triglyceride levels. 2. Organic flaxseeds are the best plant-based source for Omega3 fatty acids that boost immunity and should be added to your low triglyceride diet. 3. Wild-caught salmon and cod liver oil are the best animal-based sources for Omega 3 acids that support our heart and are easily absorbed by our bodies. 4. Walnuts, almonds and brazil nuts are very high in polyunsaturated fatty acids that help our arteries remain flexible and vital and could greatly supplement your diet for high triglycerides. 5. Soluble fiber rich foods like oats, beans and lentils help prevent absorption of low density lipoproteins, the main culprit for triglycerides too high. 6. 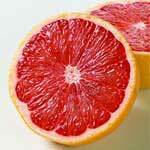 Grapefruit is rich in antioxidants and is a proven way to reduce triglycerides. 7. Grapes are rich in antioxidant resveratrol that can maintain low levels of bad cholesterol in blood. 8. Foods fortified with stanol and sterol, plant based substances, are proven to naturally lower triglyceride levels by blocking their absorption by our bodies. 9. Onions and garlic increase bile production thus helping your body process cholesterol more efficiently. 10. Niacin vitamin and artichoke leaf extract should be included in the diet for high triglycerides to help increase good cholesterol production. Avoiding foods with high glycemic index like simple sugars, sweeteners, most types of grains like bread, pasta, rice, rye, crackers, chips and baked goods is the best and most effective diet for high triglycerides.